The rectangle between Franklin Island, Greenland and Ellesmere Island, Canada shows the site where in August 2012 we hopefully will recover data from an array of ice and ocean sensing equipment that we put there in 2009. It was during this 2009 International Polar Year expedition to Nares Strait that I discovered satellite remote sensing in a new way, that is, accessing the raw digits sent down to earth from the NASA’s Aqua and Terra satellites that contain Moderate Resolution Imaging Spectroradiometer (MODIS) sensors. These two sensors are as old or older than its European companion. MODIS are now the only optical sensors at better than daily resolution which check the land, ocean, and ice now that the European satellite is not talking with us anymore. Petermann Ice Island 2010 slow movement through Petermann Fjord, break-up on Joe Island, and swift movement southward in Nares Strait. Click on image to start movie. 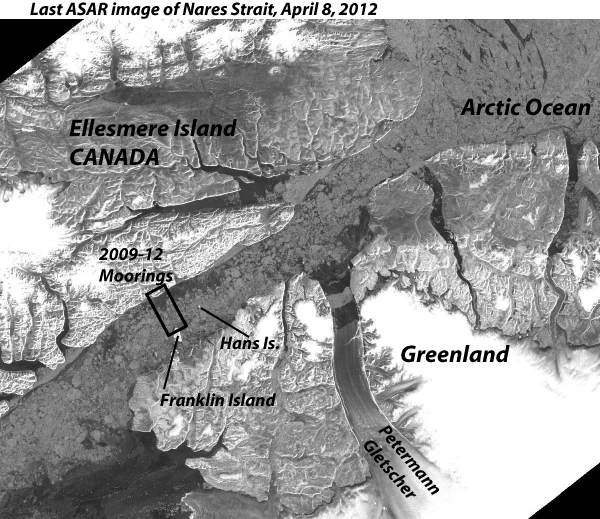 Unlike its Canadian counterpart, RadarSat, the imagery from the European radar (ASAR) was distributed widely, free of charge, and became useful to research communities and a wider public. The Danish Meteorological Institute provides an archive of imagery from both US and European satellites for all of coastal Greenland that just lost its European imagery (http://ocean.dmi.dk/arctic/modis.uk.php). Unlike the now defunct EnviSat, RadarSat is a for-profit commercial enterprise unaffordable to scientists or a public. The Canadian government funded development, launch, and initial data processing before giving it away to a private corporation. Ironically, the largest paying customer for its expensive products is the Canadian Government, but the data are rarely used for public education or research. They may as well be secret. So, the demise of EnviSat is sad news. It removes a semi-public eye in the sky. Lets hope, that its replacement by the European Space Agency receives the urgent attention that it deserves. This entry was posted in Ice Island and tagged Arctic Ocean, glaciers, Greenland, ice island, Nares Strait, radar, satellites, sea ice. Bookmark the permalink.